Like many other industries, oil production in the Soviet Union was regulated by a five-year plan. The Soviet Union had a series of five-year plans, the first of which began in 1928 and ended in 1932--one year ahead of schedule--to improve and develop its economy, often through forced industrialization. Oil was included in these plans as a lucrative export to increase the Soviet Union’s presence as an energy exporter. The oil was also needed by the Soviet Union to fuel the new abundance of machinery that accompanied the advancement and growth in industry. As in the case of the actual first five-year plan, “over-fulfilling” the five-year plan by reaching the required production targets early was a common theme in this time period, both in official government communication and, often more sarcastically, in popular culture. 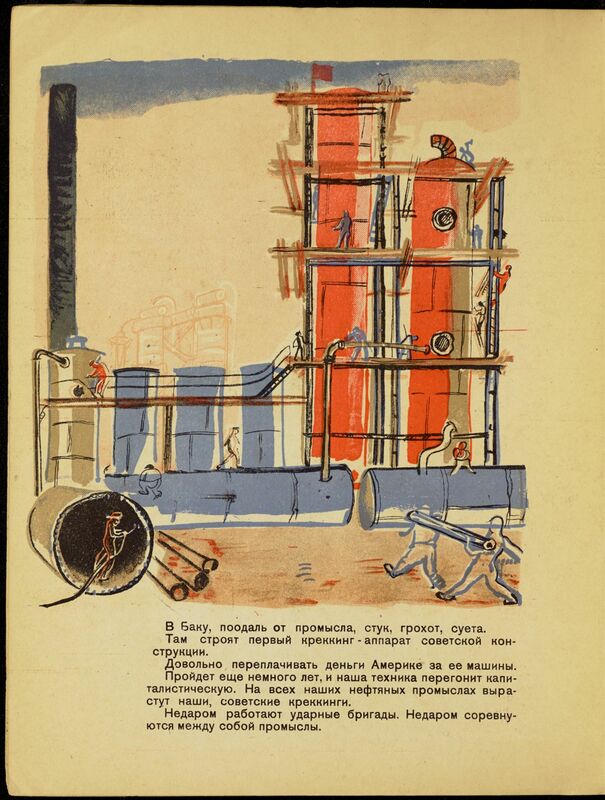 Oil emphasizes the completion of the five-year plan in only 2.5 years, typifying this boastful language.Books describing the process of turning natural resources into usable products or giving details as to how prominent Soviet organizations worked were both common and popular. Similar works to Oil include N. Ostrovskii’s How the Steel Was Tempered (1934), a socialist-realist novel and fictionalized autobiography about Ostrovskii. In 1928, three years before the book’s publication, Vladimir Mayakovsky wrote a poem about Baku, touching on many of the same themes as this text - its oil and the envious foreigners who laid their eyes on its wealth. Given the author’s potential connection to poetic circles through his wife, it is not unreasonable that he might have been partially inspired by this work. A Russian-language version of the poem is accessible here.